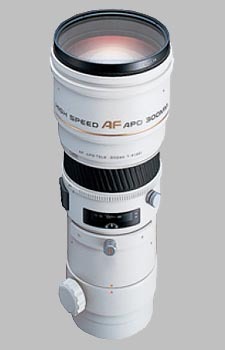 (From Konica Minolta lens literature) This telephoto lens uses two AD (Anomalous-Dispersion) glass elements to provide apochromatic correction for high quality images. Its circular aperture provides a natural-looking background, while its internal focusing system assures you of high-speed autofocus. This is a super sharp lens from edge to edge. AF is fast enough, but noisy (screw driven). One of the best lenses that i've ever owned. Sharp, lightweight, fast-AF with tripod collar, gelatin filter, and focus range delimiter, and it’s only 1/3 of the price of the excellent 300mm f/2.8 AF G. What else would be more?